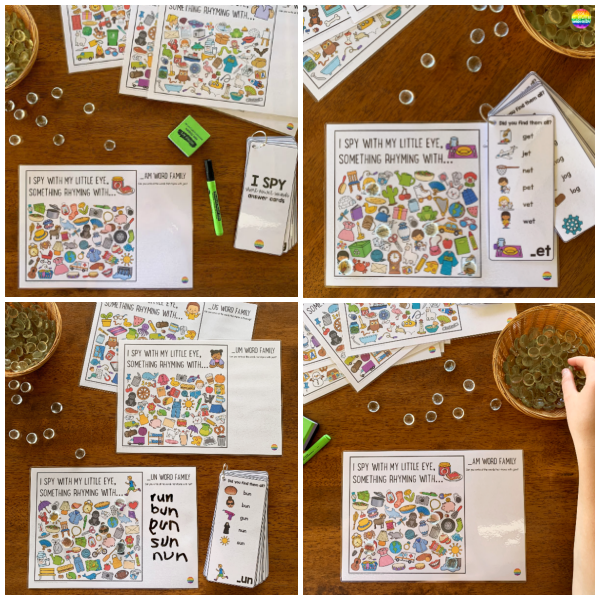 Make learning how to rhyme fun with the help of our I Spy Rhyming Short Vowel Sound Word Family printable mats - ideal for Daily 5 Word Work or literacy centre work stations. Developing phonemic awareness in the Early Years is key to learning how to read and spell. 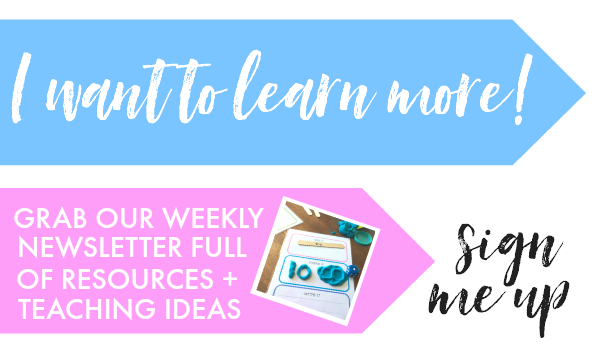 What is phonemic awareness? Basically it's understanding that the English language is an alphabetic system in which the letters represent sounds either singularly or in combination. Children who have good phonemic awareness are able to take apart words, recognise the sounds being used and be able to put them back together or manipulate them to create new words. Being able to identify and produce rhyme is a key component to phonemic awareness at preschool. 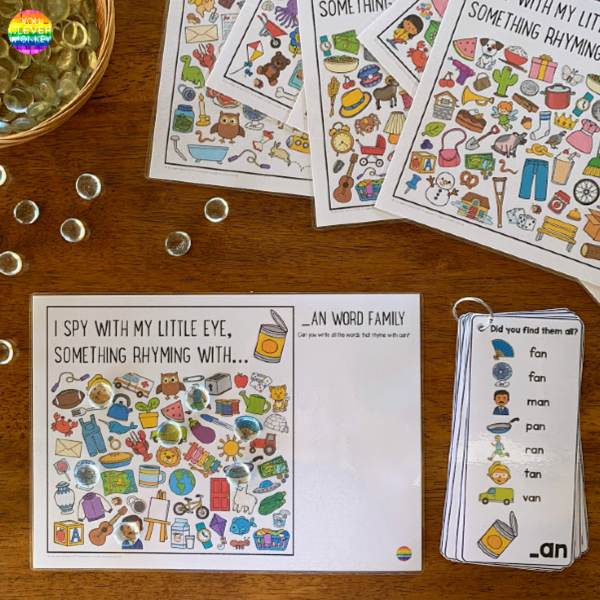 Many young children still require practice at hearing rhyme when they start school so I've recently added these fun Short Vowel Sound Word Family I Spy printables for our literacy centres in class. Developing a child's awareness of rhyme can be a useful place to start because it makes young children listen for sounds. 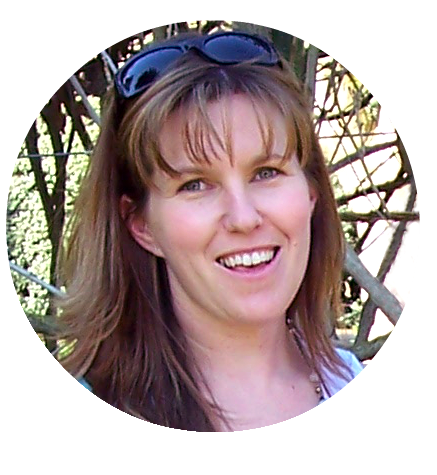 Rhyming is important as it involves the key skills of segmenting and blending sounds. A child who lacks phonemic awareness may not even know what a sound is, they may know the name of a letter but have not yet made the connection between spoken sounds and those in written words. Building rhyme awareness helps introduce to children the basic idea that words can be divided into parts. In the case of word families, we talk about the initial letter sound being the onset and the remainder, the rime. Children's understanding of rhyme and awareness of beginning sounds tends to develop at the same time. They will come to know that the first sound in the word pig is a /p/ like in pineapple and paint and that pig rhymes with dig. Literacy centres create perfect opportunities to practice skills like finding rhyming words and these Rhyming Word Family I Spy mats have been given a big tick of approval from the children in my class! 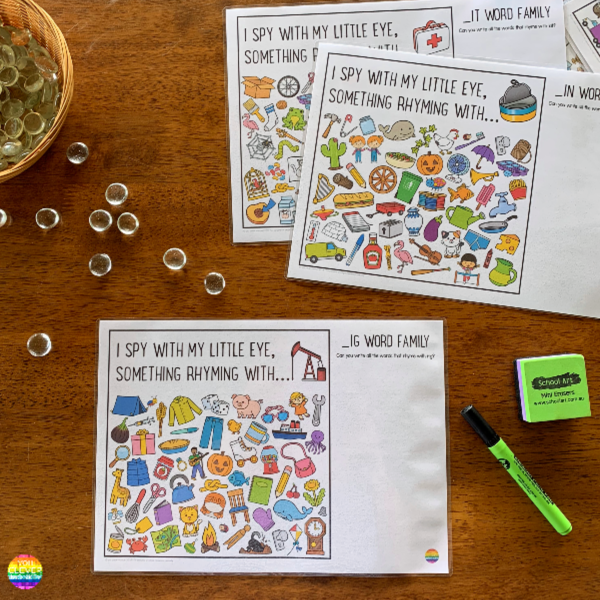 Each file comes with a ready to print Word Family I Spy Mat in full colour which you can use as is or cut off the writing space if you just want to concentrate on identifying rhyming words. Easy to read answer cards are also included. I placed mine on a binder clip to allow the children to independently check their answers making it perfect for literacy centres. 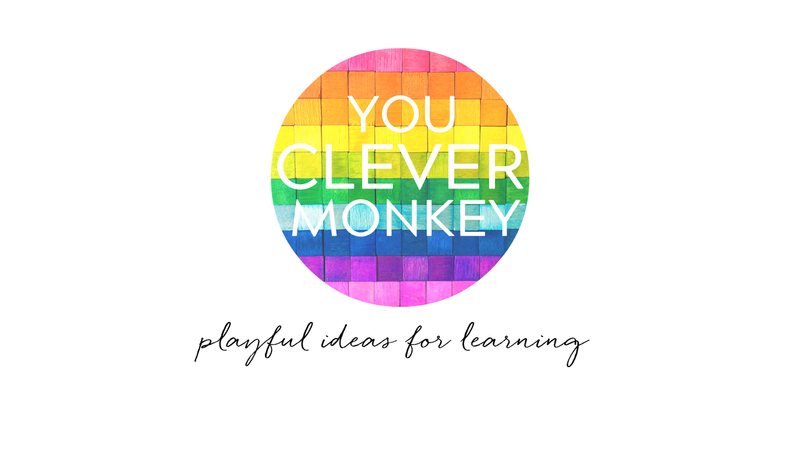 + ANSWER CARDS IN ONE EASY DOWNLOAD! 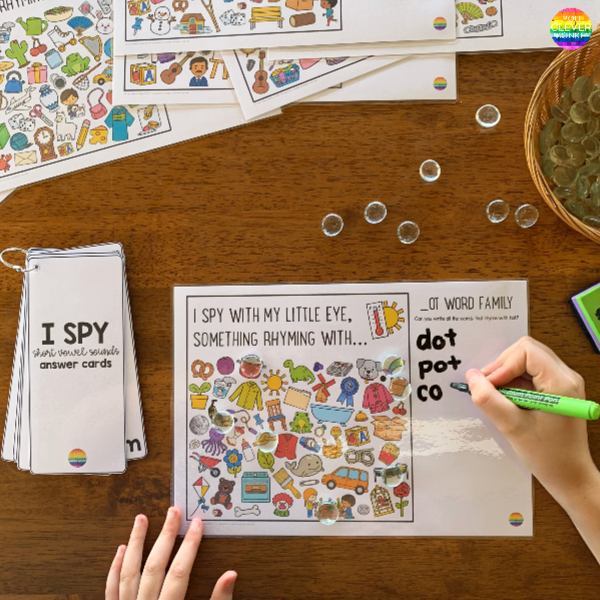 MAKE learning word families fun with these THREE READY TO print I spy cards. perfect way to practice rhyming. THREE MORE READY TO print SHORT VOWEL SOUND I spy cards - PERFECT HANDS-ON LEARNING. ANSWER CARDS INCLUDED. READY TO ADD TO YOUR LITERACY CENTER ROTATIONS, THESE I SPY MATS ARE AN INSPIRED, ENGAGING WAY TO PRACTICE RHYMING. 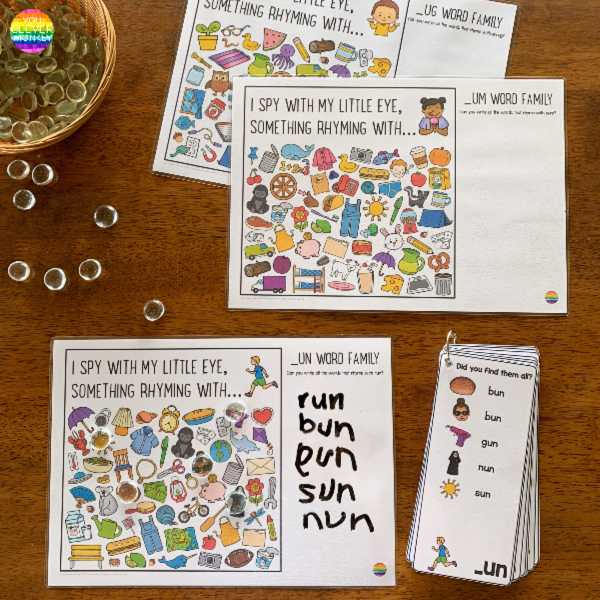 ANOTHER PACK OF THREE I spy cards FOCUSING ON THE SHORT VOWEL SOUNDS MAKING THEM PERFECT FOR CHILDREN LEARNING TO SPELL. EVERY CHILD LOVES THE CHALLENGE OF FINDING ALL THE RHYMING WORDS - PLAYFUL LEARNING AT IT'S BEST! ANSWER CARDS INCLUDED. 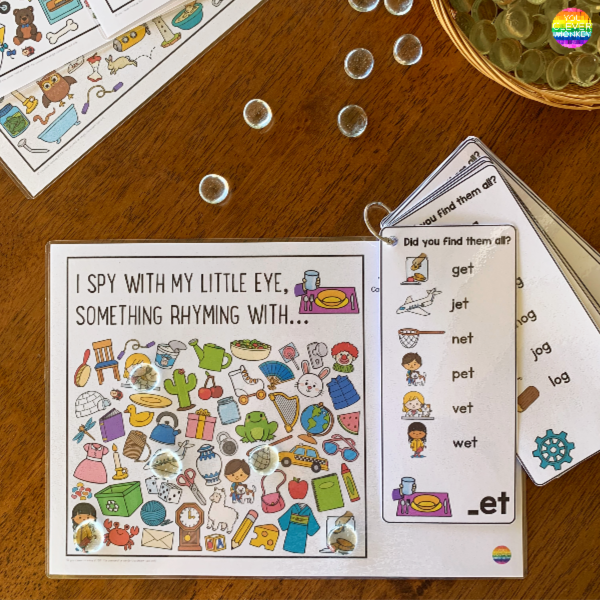 ALL 15 RHYMING I SPY MATS PLUS 3 BONUS MATS INCLUDED IN THE BUNDLE. ANSWER CARDS INCLUDED ALONG WITH COVER.